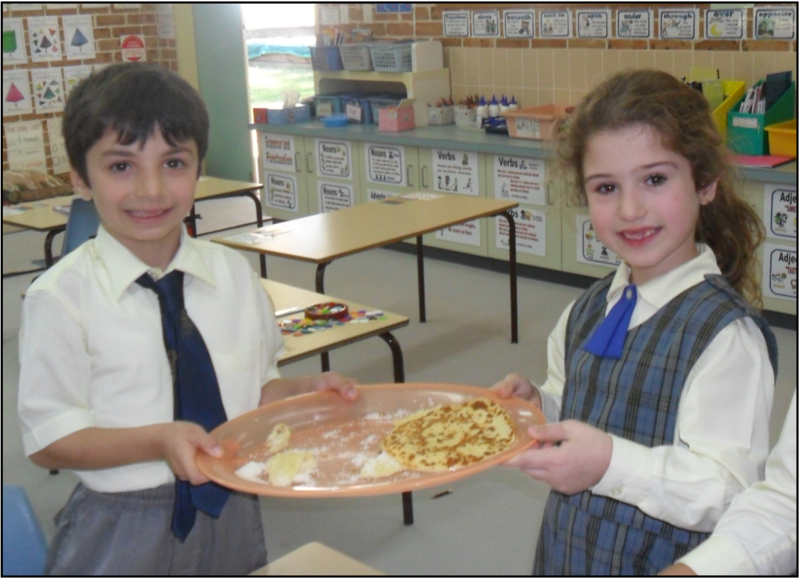 AGBU Alexander Primary School - Blog: MAKING PANCAKES! The students of Year 1/2 have been learning about India. They read a book about Indian cultures and customs. The book had a recipe for making coconut pancakes which the students were eager to try. Here is an account of what they did. First Mrs Dernee took out the frying pan and we made the filling for the pancakes. We put in a spoon of butter and it looked like it was slipping. After the funny slipping butter we put in the grated coconut, sugar and cardamom. The coconut made an enormous white hill and we had so much fun smashing it down and stirring it around the pan. Then we took the filling mixture out of the pan and we started to make the delicious pancakes. First we got a big bowl and we cracked an egg in it, we added a pinch of salt and some sugar too. Then we added pain flour and we mixed, and mixed and mixed until all the lumps disappeared. Next we poured the batter in the pan. Then we had to wait until there were little bubbles on top of the batter. After the bubbles appeared we all had a turn of flipping the pancakes, that was great fun. When the pancake was brown we took it out of the pan. We put the pancake on the plate. We then place the cooked coconut on the pancake. Next we rolled the pancake up with the filling inside. Sometimes the pancakes were too hot to roll, so we had to wait patiently until they cooled. Lastly we were able to eat our scrumptious pancakes. Everyone is enjoying learning about India especially when we get to do fun activities like cooking!